When she joined the family in 2009, we already had our 2 boys, Titouan and Cyprien. We wanted to find a way of spending some leisure time together as a family with an animal and a way of getting to know each other better and bond as a family. 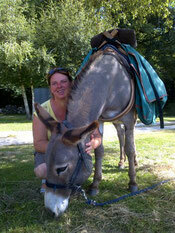 So, why not go away together for a 4 day trek with 2 donkeys in the Aveyron region! We all had a wonderful time, both adults and children, and thanks to our two long-eared companions we all got closer and built strong ties during the trip. The four days spent with Griotte and Hirsute were enough to convince me that I had to change jobs! I loved everything about them, their kindness, their patience, their soft gaze, their love of food... I truly fell in love! My decision was made; I would propose hikes with donkeys in the Loire Valley. 'A dos d'âne' was launched in 2010 and then became 'Les ânes de Madame' in 2016! 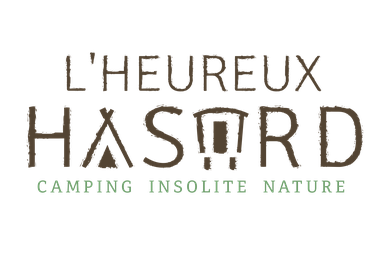 And the adventure continues with the opening of our one of a kind countryside campsite L'heureux hasard. These two activities are grouped together under my daughters name, thanks to her I made a major life change, Le Monde d'Ossyane. A donkey driver by trade, and proud of it! I really love sharing my passion for donkeys... Feel free to interrupt me, as once I start talking about my long-eared friends, I find it hard to stop! Born and raised in Sologne, I love hiking and never tire of re-discovering the gems of my beloved Loire Valley, it's hidden secrets and beautiful nature. Hiking with a donkey is the ideal opportunity for me to share my discoveries with you, my personal favorites and to help you to discover the Chateaux country in a whole new way! Without sharing and exchanging, my job would be soulless! Our donkeys bring some soul and special meaning to everything we do! Game-keeper for 23 years in the Cheverny forest, nature is his domain! The stags roar and the flora and fauna found in Sologne are no secret to him! A true expert on wild and edible plants found in the Cheverny forest, you will have to try tasting thorn shoots and medlars... With training in herbal treatments, he enjoys helping you to discover the many uses and qualities of wild plants. A bee-keeping enthusiast, he loves talking about 'his bees' and you will get to taste their honey. 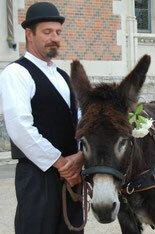 Donkeys are also part of his day, he takes care of their hooves, trains them and cuts hay... In fact, the main things necessary for our donkeys well being, without forgetting the hugs!